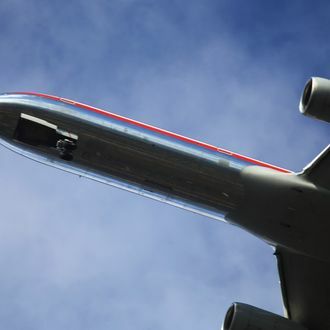 For the second time in three days, a row of seats detached during an American Airlines flight, leading the Federal Aviation Administration to wonder what the hell is going on over there. A plane leaving JFK yesterday morning for Miami was forced to turn around when three seats came loose on a Boeing 757. Over the weekend, another American Airlines 757 had the exact same problem and was diverted to JFK as a precaution. “Got an unusual one for you,” the pilot told air traffic control on Saturday. “Passenger seats rows 12D, E, and F, uh, came loose out of the floor. Passengers are unable to, uh, sit in that seat.” Not that unusual, apparently. American, which declared bankruptcy last year, is falling apart, now literally. Huge delays have become the norm after the company scrapped all of its labor agreements, upsetting overworked pilots, who seem to be getting some revenge by pointing out every little maintenance concern. (Although, maybe they have a point.) “Safety is our top priority,” the airline assured in a statement. “We never have — and never will — compromise the safety and reliability of our fleet.” Getting where you’re going just might take a little (or a lot) longer, with an airborne scare thrown in for some spice.